01. Firstly the smell of this bath bomb is just gorgeous. It's not too sweet and it's not too overpowering either. The smell of the jasmine definitely comes through and it definitely gives you a relaxing sensation through the smell. 02. When placing this bath bomb into your bath, you are visited by some beautiful sights. 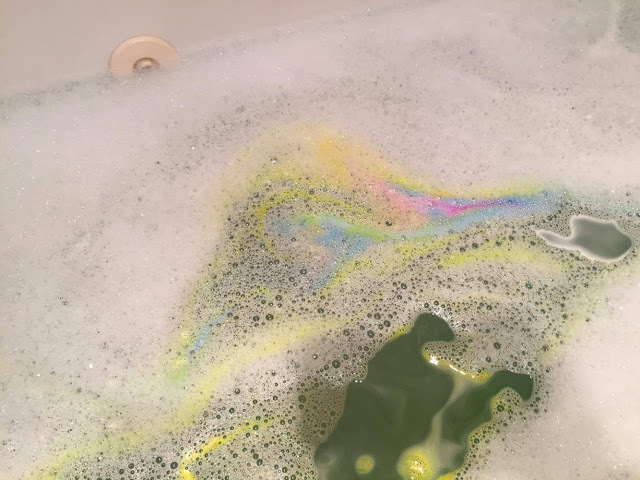 The shape and weight of the bath bomb, allows it to spin, releasing blue and yellow on either side. Creating a very eye pleasing effect. 03. Unfortunately, this bath bomb doesn't leave your bath looking the nicest. This is probably the only down side to the bath bomb. When the colours mix together you are left with a deep dirty green colour, so not the most relaxing of colours, however this didn't ruin the experience completely it just didn't leave the bath looking that relaxing in the end. 04. Another slight problem to this bath bomb is that the centre of the bath bomb takes ages to dissolve, however I was in the bath long enough for it to completely dissolve so this didn't bother me much at all. It's great if you're looking for a bath bomb that lasts a while dissolving in the bath. 05. This bath bomb left my skin feeling super soft and I definitely felt relaxed from the smells of the bath bomb as well. I felt very clean afterwards as well. Overall I did like this bath bomb, it's not my favourite and I don't know if I'll be running back to it soon but it was definitely a lovely experience. I loved watching it dissolve the most and I also loved the smell. Definitely give this bath bomb ago if you love deeper and jasmine scents. I hope to upload at least one or two more reviews of my Lush bath bomb experiences over the holiday break. 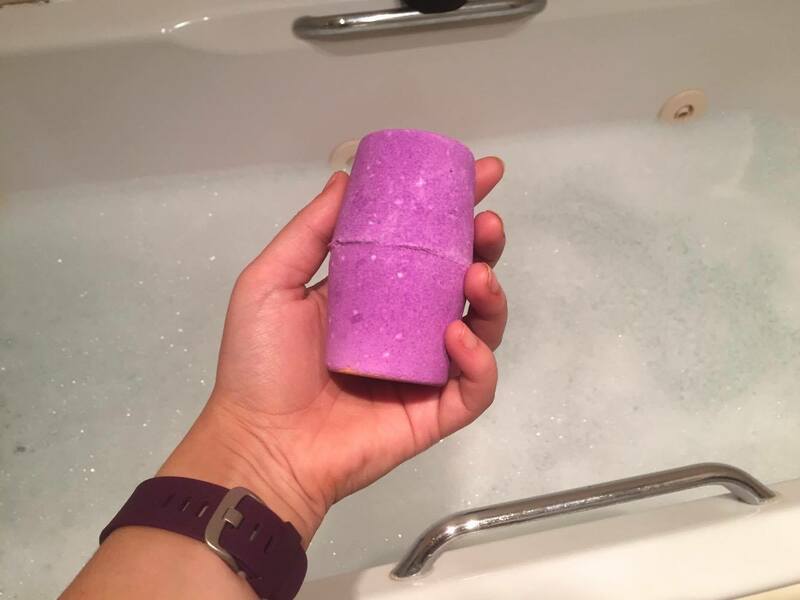 Have you been trying out the lush bath bombs this season? What's your favourite, I would love a recommendation. Really enjoyed reading this, Tabitha! I love the lighter scented products from LUSH as some of them are just too overpowering for me, so this one sounds ideal! Jasmine is one of my favourite scents too! The colours of this bath bomb are beautiful, just a shame it stains the sides of your bath so much haha! Great review, very thorough! Thanks for sharing your honest thoughts!